Our ten years of data analysis service – means that hundreds of tabulations, tens of thousands data-checks, millions of numbers have passed through us. Our prior experience of “classic” market research gives us a profound insight in the needs of a PM regarding data. We work exclusively with our own highly specialized tabulation software N’table, which we continuously develop drawing upon our project experience, and the needs and expectations of our clients. Our tables take on average as little as a couple of hours to maximum a day to be completed. If you operate some software independently (e.g. 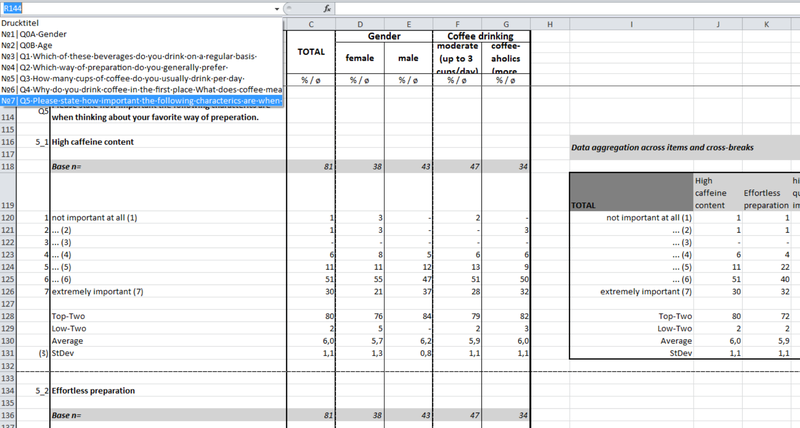 SPSS) or even struggle with Excel formulas, you definitely will not reach a comparable output in the same time. Professional tabulations are cheaper than you might expect. Our prices start as low as 250 euro for a small set of data. Even for large surveys we arrange our prices affordable for every research agency. 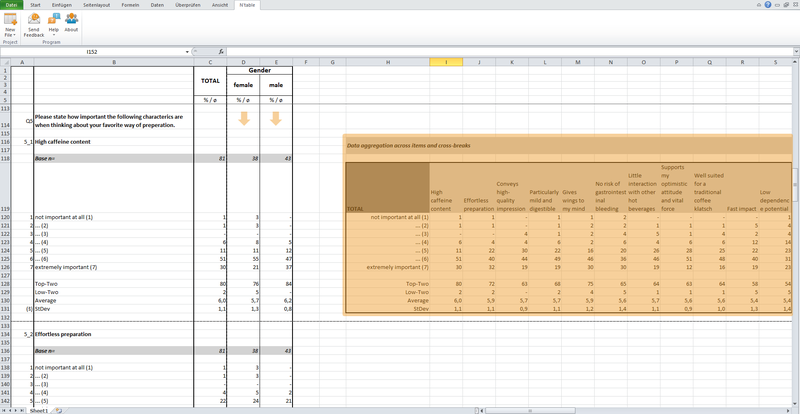 Our tables have a column structure: all values of the same type (absolute, percentage, significant differences) are displayed vertically in one column each. 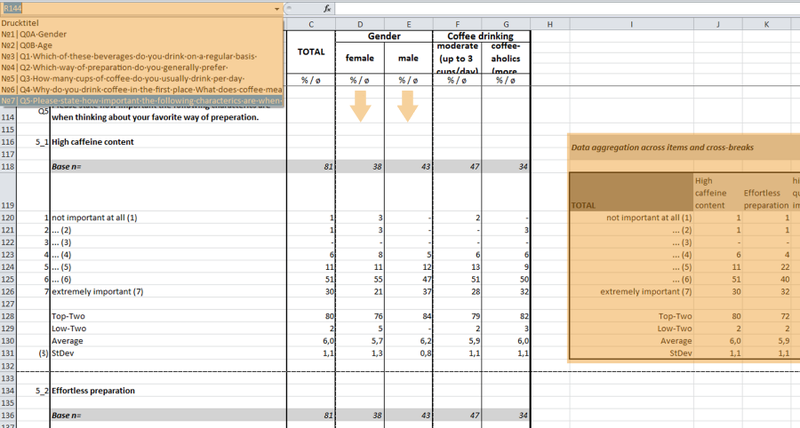 This makes it easy to comprehend the table and copy the data in whole blocks for further processing. 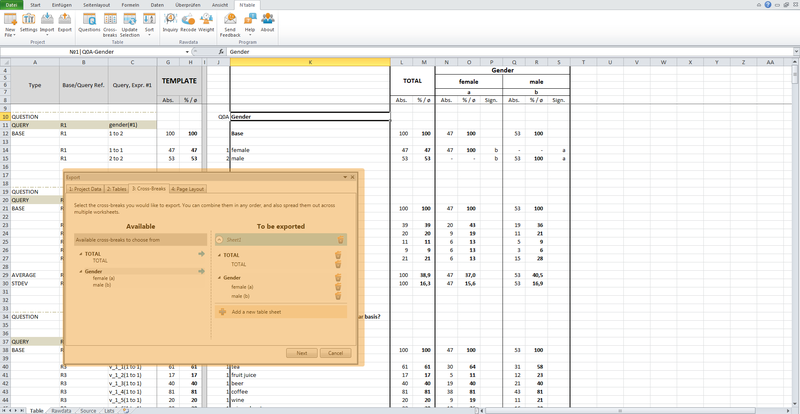 All of the classic parameters for analysis are at your disposal: top- and low-boxes, mean, median, as well any other formula from Excel’s arsenal. Tests of significance are available at three standard levels of 90, 95 and 99%. 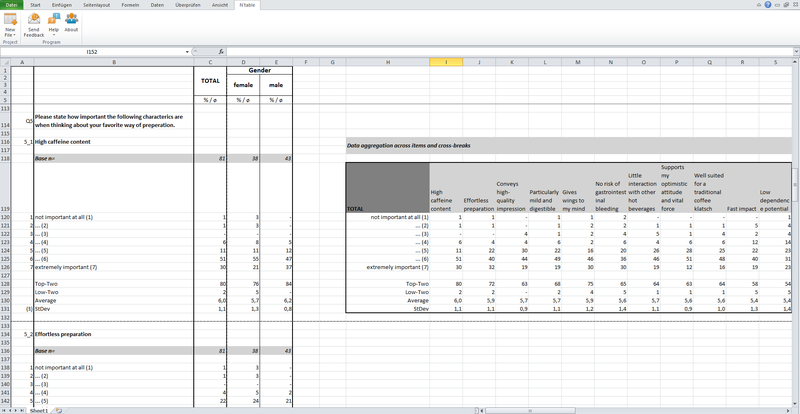 Having numerous, well-structured cross-breaks is crucial for a proper analysis and an insightful report. We can deliver a practically unlimited number of cross-breaks of any difficulty. If needed, two-level cross-breaks are also possible. A unique feature of our tabulations is a specialized charting output. 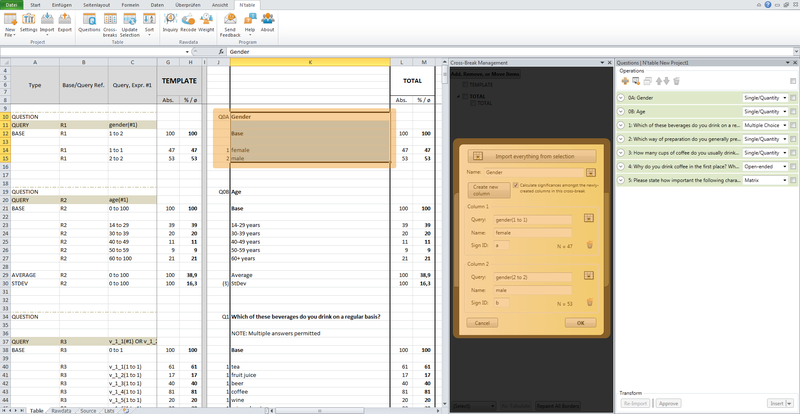 This table is formatted with only percent values to enable instant copying into PPT presentations. 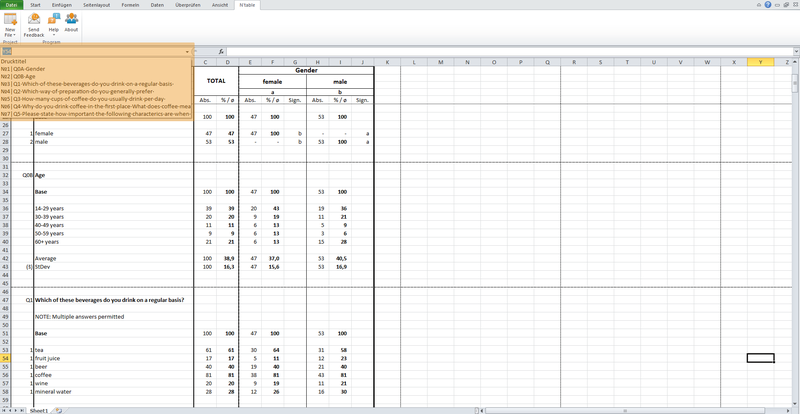 Besides that, all of our matrices are encoded with special overviews for the simple creation of stacked bar charts. For better navigation, each table has a hyperlinked dropdown menu which enables easy “jumping” to any question and eliminates the need for endless scrolling. * - Standard complexity, data format and table's structure are assumed. Prices exclude VAT for EU customers (where applicable). 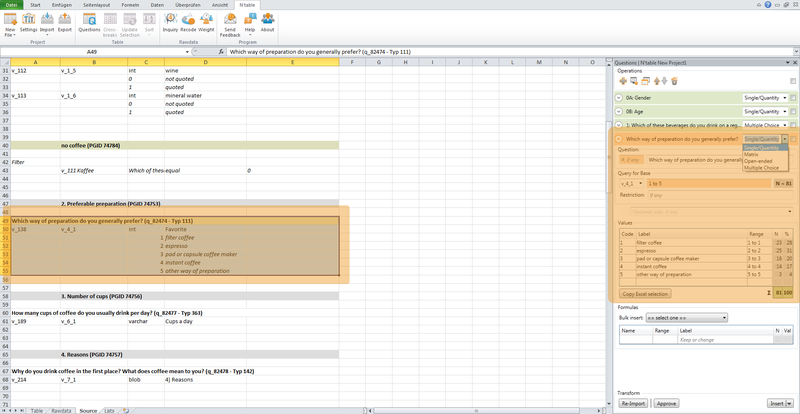 Our tool is Excel-based. This means: a highly familiar environment, all of the Excel functions and formulas are at your service. No need for tedious learning – just install and tabulate! N’table is created for “mere mortals,” not for computer geeks! Our user-friendly wizards enable you to efficiently tabulate without learning a single line of code. 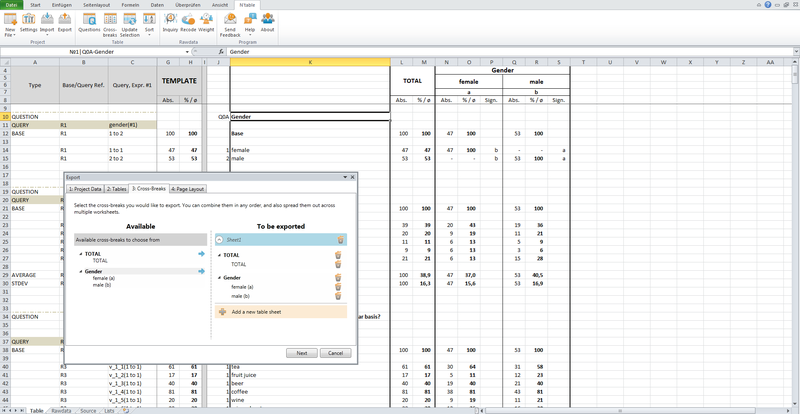 Compatible with most codebook formats or creates its own codebook directly out of an SPSS data file. Gathers and (re)tabulates the questions quickly and by the bundle. 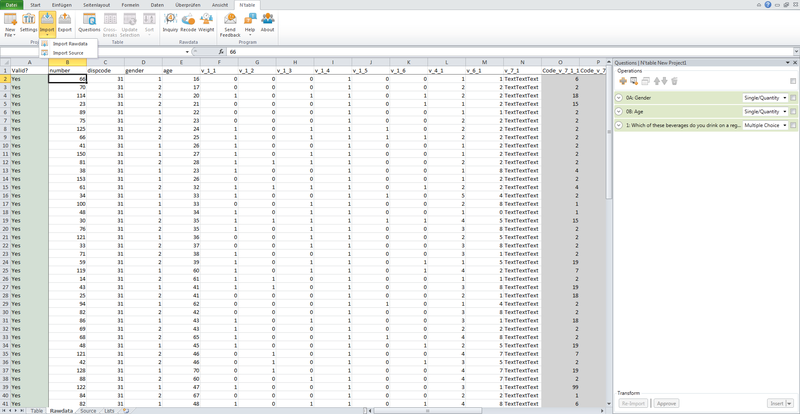 All parameters you need for professional data analysis are included: top- and low-boxes, mean, median, weighting, significance tests, smart checks and data cleaning routines. Our tool provides for the simple production of cross-breaks of any number and complexity. Upon export, a uniquely formatted table, which facilitates a subsequent charting, is created. Our software is intuitive, based on WYSIWYG-principle and can be learned within hours. If you are already familiar with Excel – you are on the right path to mastering N’table! Do you want to risk a glance? 1. Rawdata imports (xls, sav, scv) via special wizard. 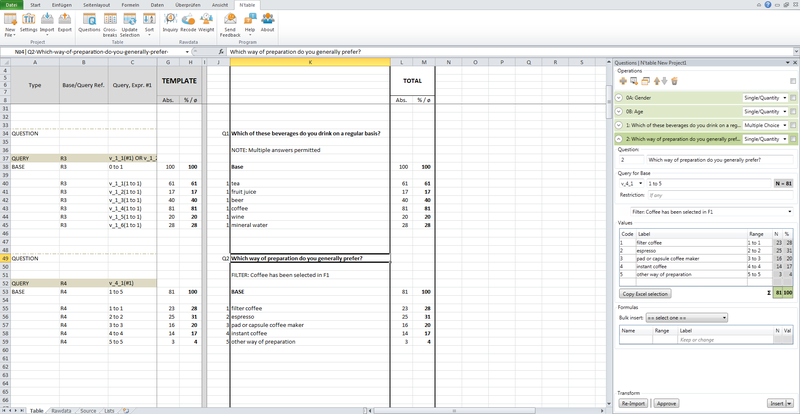 All relevant working spaces (table, rawdata, codebook) on one page. Special wizard for all operations with questions. 2. One-click-import of selected data from codebook into the question wizard. 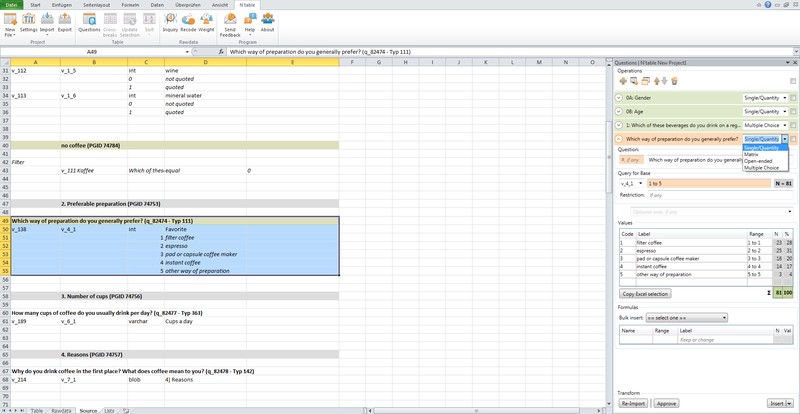 Automated detection of question type, base, codes and immediate calculation of values. 3. One of our integrated data checks will inform you if value distribution goes wrong. 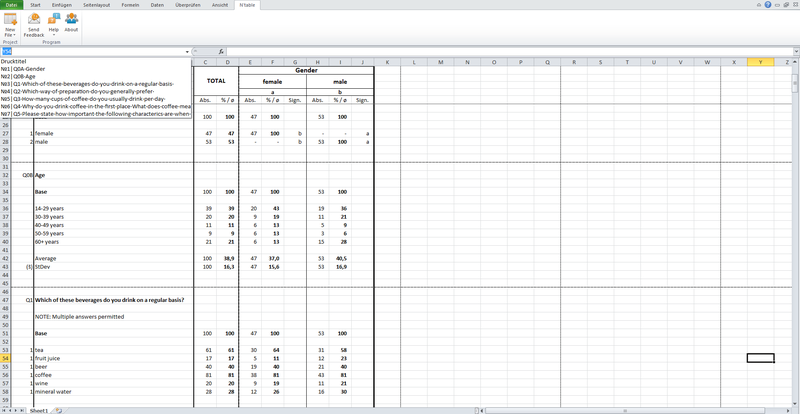 One-click-tabulations via Insert button. 4. 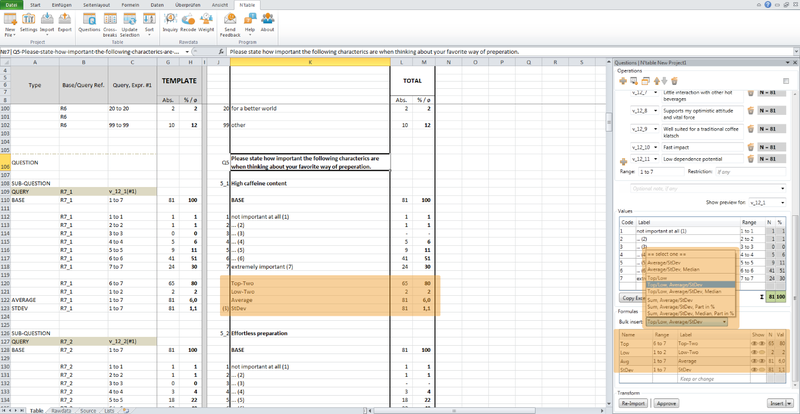 Instant tabulation of matrix questions in a single operation. The calculation of top- and low-boxes, mean, median, etc... is also available in bundles. Optional overview of each parameter. 5. Hassle-free creation of a cross-break of any difficulty directly from a table or alternatively using syntax. Two-level cross-breaks are also possible. 6. Our export wizard allows for any combination of cross-breaks in one or multiple Excel sheets. 7. 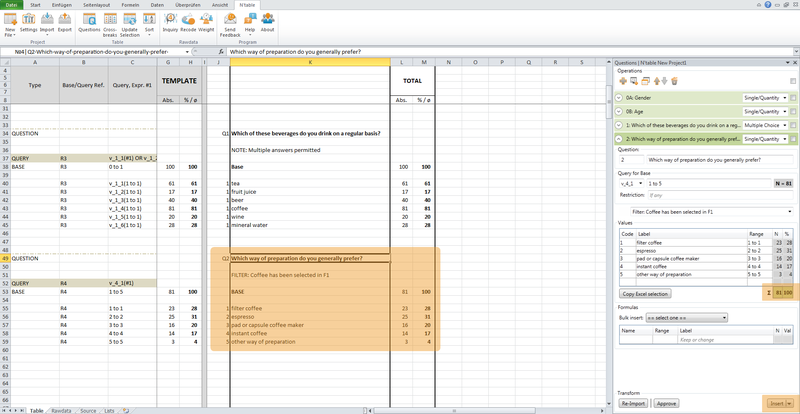 A clear, Excel-native export sheet. Hyperlinked dropdown menu for quick navigation without tedious scrolling. 8. Specialized charting output formatted with percent values and stacked overviews for smooth copying and instant production of PPT charts. 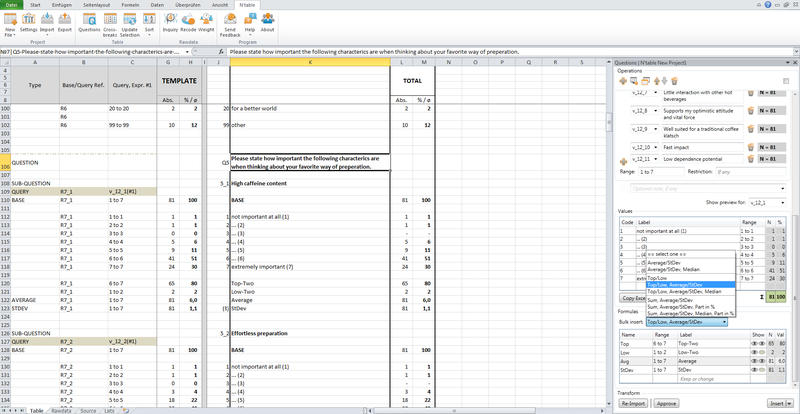 Activate a tabulating tool per project, as often as you need it! All of this is topped off with a Free version, which is available for small data sets. Try now! * - Prices exclude VAT for EU customers (where applicable).